Did you know that more than 2M people across the US live in assisted living and senior living communities? With over 60,000 facilities in the US alone, choosing a long term living decision can be overwhelming. One thing that can ease the process is understanding what is important to this next generation of seniors. As experts in senior living commercial design, we’ve noticed that for many this includes the architectural design, array of amenities, and feeling like the residents are at home. The days of dining room only options are quickly fading away. Many senior living communities now have alternatives to enhance the culinary experience and provide more flexible options. Some of these new dining initiatives include onsite restaurants, custom menus reviewed by a nutritionist, bistros, and grab-and-go markets. This not only makes it more convenient for when family and friends come to visit, but it also offers residents more independence and choices. Technology serves a variety of functions within senior living communities. It not only improves the resident experience, but it can also be used to enhance security and safety. Technology helps residents stay connected and mobile whether it be to family and friends or to staff members in the event of an emergency. New wireless devices can also help monitor a resident’s health, act as a motion detector, or signal for help if they fall. In addition, some communities also offer Wi-Fi cybercafes, workspaces, and business centers where residents can gather in an intellectually stimulating environment. This next generation of seniors take health and fitness much more seriously than previous generations. With this in mind, many communities now include a robust fitness center with state of the art equipment, massage rooms, day spas, yoga classes, aerobics, and swimming pools. Beyond fitness amenities, modern seniors also want wellness programs that enhance the mind and everyday experience by including healthy food options, high indoor air quality, and natural lighting. Sustainable design concepts that have previously been applied to schools or offices are now also being applied to senior living communities. Some of these green features include energy and water conservation, views of nature, efficient lighting, and even recycled materials. Greenhouses have also become commonplace in some areas as they offer residents an opportunity to garden as well as onsite chefs a space to plant fresh herbs and ingredients. Warner Design Associates’ designers, some of which are LEED certified, are experts in design and function with sustainability in mind. Our prediction is that these key trends and amenities will continue to expand as more communities, designers, and architects focus on what the modern senior cares about in a long-term living facility. We incorporate each of these aspects into the design efforts at independent, assisted living, and memory care facilities so that residents have the best in design, comfort and functionality. View examples in our portfolio. 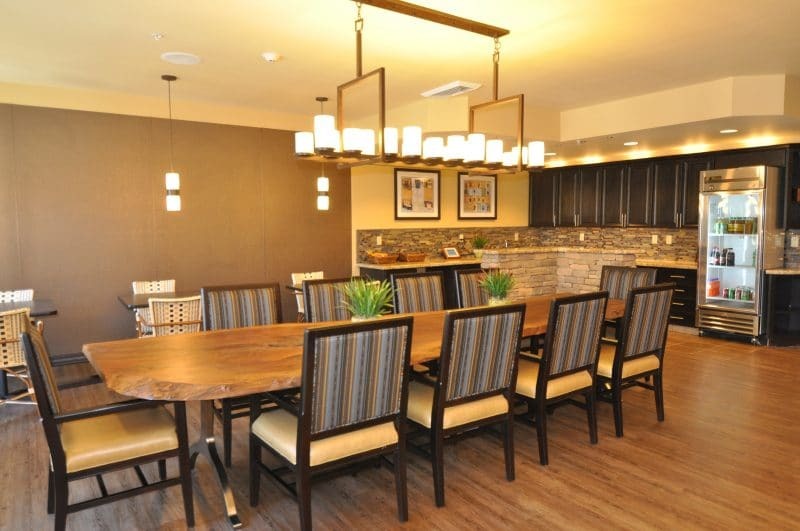 Regardless of trends, our focus at Warner Design Associates is always on providing familiarity and comfort so that residents truly feel at home.